This book is fascinating on many levels. It is a glimpse, through her own words, into the life of a woman, Gwen, born in the nineteenth century into a life of privilege. Much of her early adult life was lived in expatriate communities in Egypt, Hong Kong and India. It reveals - perhaps inadvertently - the attitudes and assumptions which characterised the life of those communities and of her class and upbringing. It is a vivid glimpse into a long-vanished world which holds the reader in thrall. Gwen's words show a woman deeply in love with a husband who was controlling, selfish and often heartless to his wife and children. She appears to accept his behaviour without criticism - yet it is her honest portrayal of his behaviour which tells us of his unlovable character. It is her view of him which tells us what manner of man he was. This remarkable woman lost her husband through his adultery and then desertion. She lost her beloved son in death. Yet her daughter is able to describe how Gwen's courage carried her through to a later life of independence as a business woman and strong single mother to her two remaining children. 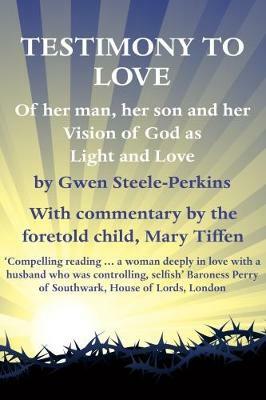 Gwen writes of love as the driving force of her life. But overall, it is her faith in the God she believed spoke to her in a vision of light and love which carries her story through. Her vision of the Light was the rock on which she stood through all her travails and is the enduring theme of the story she writes.